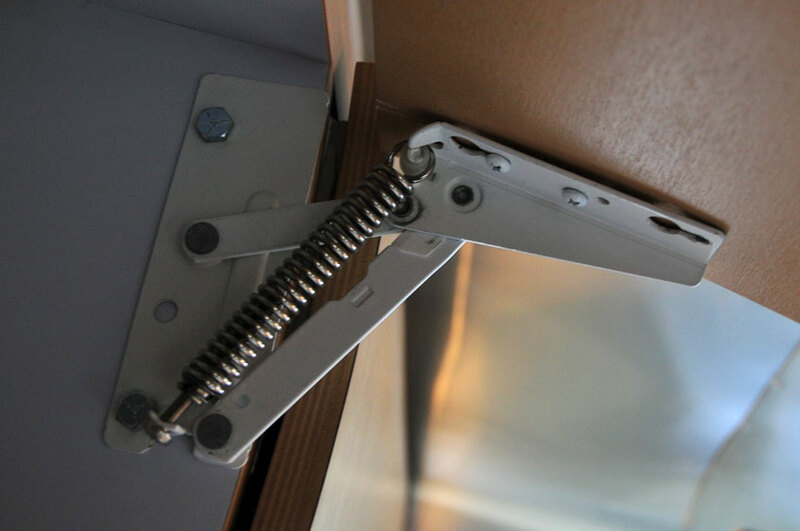 Last week one of the screws came out of this hinge in the cabinet over the dinette. Last night when I opened the cabinet, all 3 screws fell out. None of the holes have any grab. I’m not sure how else to describe the issue, but basically you can’t screw the screws back in because there’s just a big empty hole. In the picture above they’re just sitting in the holes, if we tried to close the door it would fall off the hinge. We won’t be going back to the dealer until the spring, so we have to fix this on our own. Wood-working readers out there, what’s the best solution? Should we fill the holes with wood glue, let it dry and then screw the screws back in? When MDF (medium density fiberboard) gets stripped where the screws go, there are a few ways to fix it. Wood glue (Gorilla Glue would be my suggestion) and wood filler should do the trick for a time, but in my opinion, you might be better off doing a little woodworking, cutting, trimming and sanding actual wood doors yourselves and then replacing the doors (to all the cabinets as this problem could afflict the others). Personally I think this is a design flaw, to use MDF here, and that the dealership should bear the burden of cost. If you do go the wood glue route, I would put the screws in and glue them into place rather than put glue into the holes and screw into that. You could also use anchors like one would use screwing into drywall when there is no wood stud available but again, that strikes me as a more temporary solution. Good luck! Good suggestions. You might consider going to the next larger, not longer, wood screw. Obviously it would have to be able to go through the hardware, but it is an option. One emergency fix that you might try is to put wooden match pieces in the screw hole. Almost any wood sliver will work… just keep adding the pieces till the screw holds. Be careful with Gorilla glue it expands as it dries and I think it would not let you remove the screws if you glued them in. I vote for the wooden match stick trick, its worked for me before. The other thing I’ve done in this case is buy some dowels and glue those into the holes and then screw into that. Sturdy looking hardware, wimpy door, huh? A stronger alternative to the above might be to get some 2-part epoxy, mix a little with wood dust filler, and fill the existing holes. When it dries hard (a day or two) sand it smooth and drill new holes into the epoxy. Should hold pretty well if screws match the hold size appropriately. Thanks all, I love all the man feedback. Bri filled the holes with slivers of wood and wood glue. It looks like it’s going to work (it’s drying now). Yeah, it should work. We had to do the same thing at one point, and used a combination of match sticks and Gorilla Glue. It seems to be a permanent fix. The epoxy would be better but I don’t think you’ll need to go to that extent. I guess if you want lots of comments you should post more simple fixes that guys can relate to. Wait till you ask us for the best way to fix a leaky faucet. you are letting Airstream know about this before you return to the dealer? Yes, we’ve called Airstream and they know about our list, but apparently it isn’t necessary. The dealer takes care of the warranty. Kind of late but you could drill new holes in the bracket where the “wood” is undamaged and add more screws. This could be done in conjunction with the repairs you have already made. Thanks Croft! We ended up putting hardwood shavings to fill the gap and it’s been fine ever since, but thanks for the suggestion! Wood glue and wooden golf tees. The golf tees are tapered like the screw was. When it dries, cut it off flush and make a new hole. Any idea where these hinges come from? I can’t find them available anywhere. I found them at Hardwaresource.com, consider themselves the hinge experts.